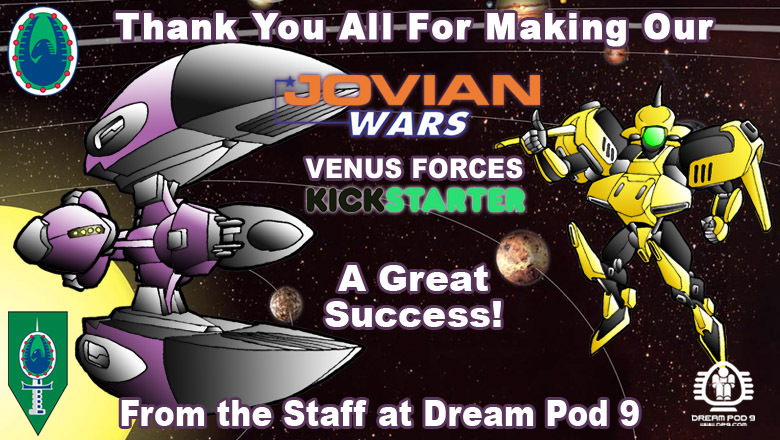 Jovian Wars Venus Kickstarter a Great Success! The Jovian Wars Venus Forces Kickstarter has ended with $8,708.00 CAD pledged for the new Venus Spaceships, Exo-Armor & Bomber Squads. A Big Thank You to all our Backers for your amazing support that will make the new Venus Forces available to everyone after all the Backer Reward Packages have been shipped. 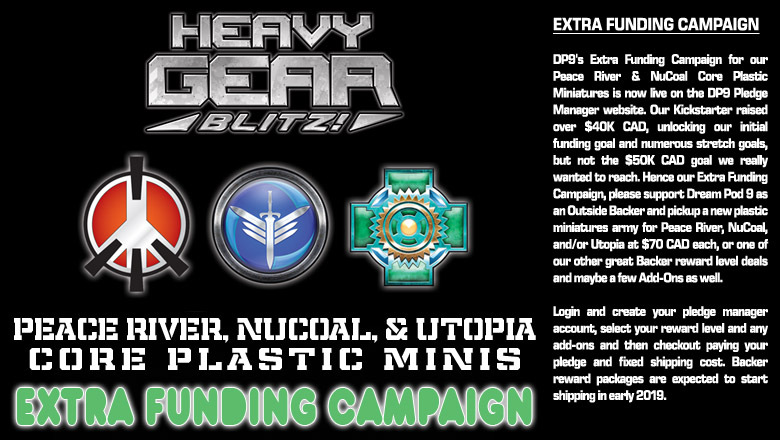 Peace River, NuCoal, & Utopia Core Plastic Miniatures Extra Funding Campaign is Live! DP9's Extra Funding Campaign for our Peace River & NuCoal Core Plastic Miniatures is now live on the DP9 Pledge Manager website. Our Kickstarter raised over $40K CAD, unlocking our initial funding goal and numerous stretch goals, but not the $50K CAD goal we really wanted to reach. Hence our Extra Funding Campaign, please support Dream Pod 9 as an Outside Backer and pickup a new plastic miniatures army for Peace River, NuCoal, and/or Utopia at $70 CAD each, or one of our other great Backer reward level deals and maybe a few Add-Ons as well. The pledge total will be updated on DP9's www.dp9.com website. Login and create your pledge manager account, select your reward level and any add-ons and then checkout paying your pledge and fixed shipping cost. Backer reward packages are expected to start shipping in early 2019. 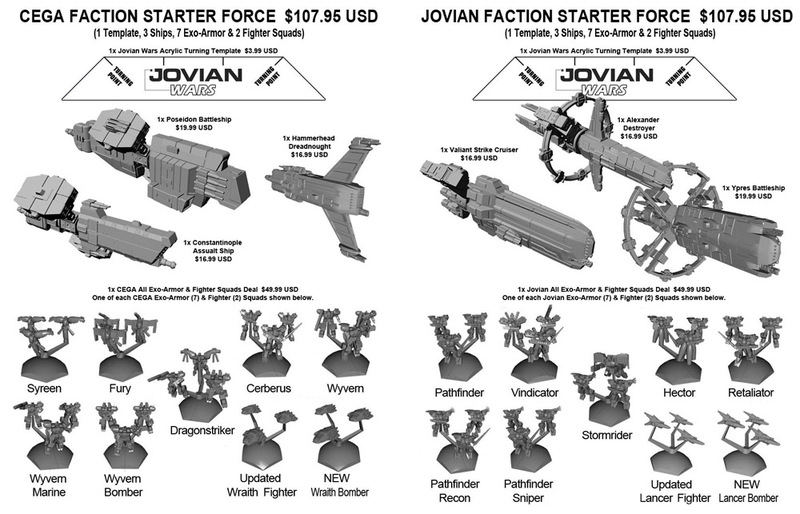 Jovian Wars Starter Forces Available! 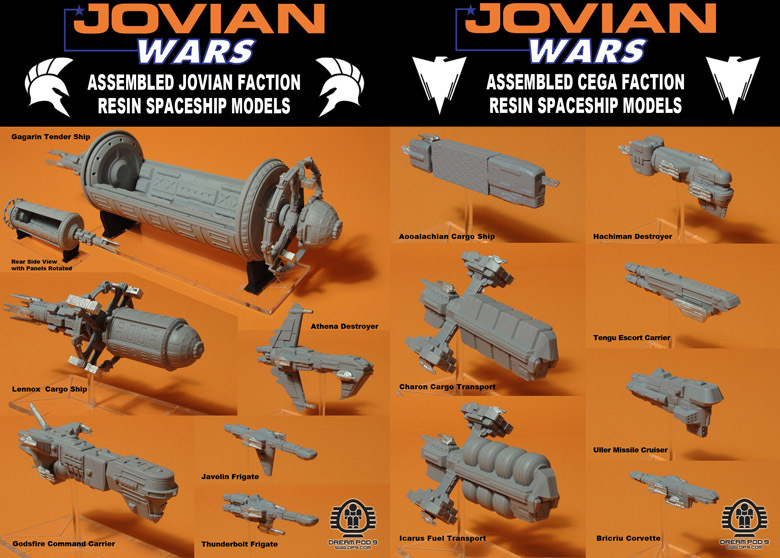 Jovian Wars Spaceship Miniatures Now Available! 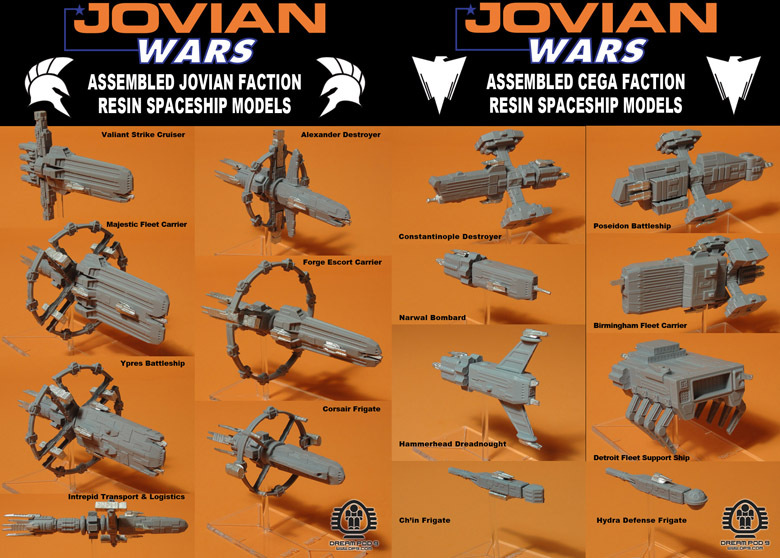 New Jovian Wars ships and parts have been added to the online store, which now include the Ch'in, Hydra, Detroit, Narwal, Hammerhead, Constantinople, Birmingham, Appalachian, Charon, Icarus, and remastered Poseidon, Hachiman, Tengu, Uller, & Bricriu ships for the CEGA faction and the Corsair, Intrepid, Forge, Ypres, Alexander, Majestic, Gagarin, Lennox, and remastered Valiant, Athena, Godsfire, Javelin, & Thunderbolt ships for the Jovian faction. Plus complete collection of CEGA and Jovian Exo-Armor & Fighter squads, Click the images above to visit the Jovian Wars Spaceships, Exo-Armors, and Figher Squad Online Store Section and pick up some great ships for Christmas. You can also click here to download our free Jovian Wars Beta Rules ebook hosted on DriveThruRPG and check it out. More ships for both factions will be released just before Xmas and we are planning another Kickstarter in Fall 2018 to make all the Venus faction ships. Also remember our Pod Reward Points (Customer Loyalty Reward Points) you'll receive for items purchased on the Dream Pod 9 Online Store, that you can use on your next orders. As a guideline, you will receive 1 point for every $5 to $10 of an item's value, items under $5 don't receive reward points. An order of a $5 to $14.99 product would give 1 reward point, a $15 to $24.99 product would give 2 reward points and so on. The reward points can be used on your next order to reduce the cost of products ordered and/or get them free, depending on the numbers of reward points used.